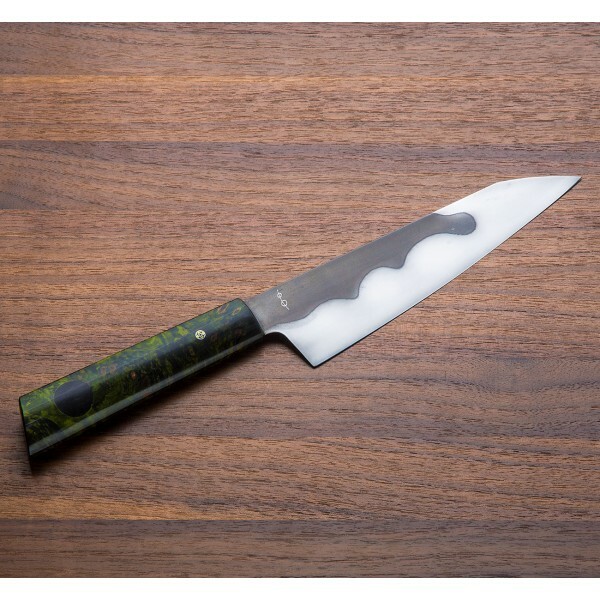 Don Andrade's Personal Chef model with hidden-tang construction and dressed in beautiful dyed and stabilized green buckeye burl with an ebony inlay and mosaic pin. The differentially heat treated 1095 carbon steel blade is polished and etched to reveal Don's enviable two-tone finish that provides not only good looks, but superb performance. 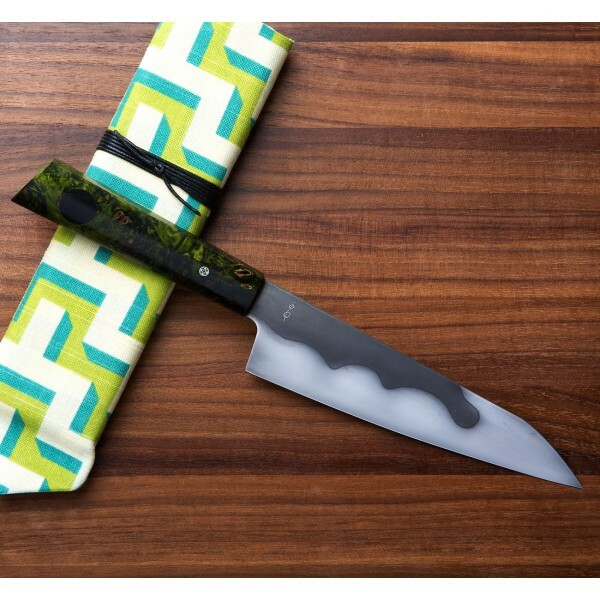 At 7.5" (190mm), an excellent knife made for every task in any kitchen. A cloth-covered protective case is included. 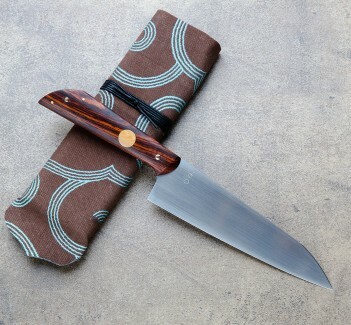 Another stunning sole-authorship knife from one of the best in the business anywhere in the world. 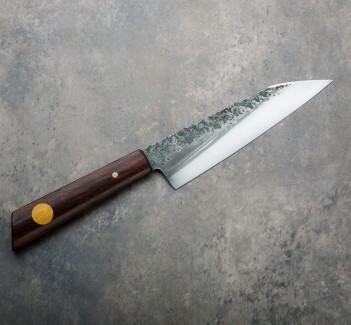 Don Andrade builds every knife by hand at his shop in Los Osos, California, relying on his years in fine dining kitchens, decades sculpting bronze and stone and 10+ years bladesmithing heirloom quality chef knives. 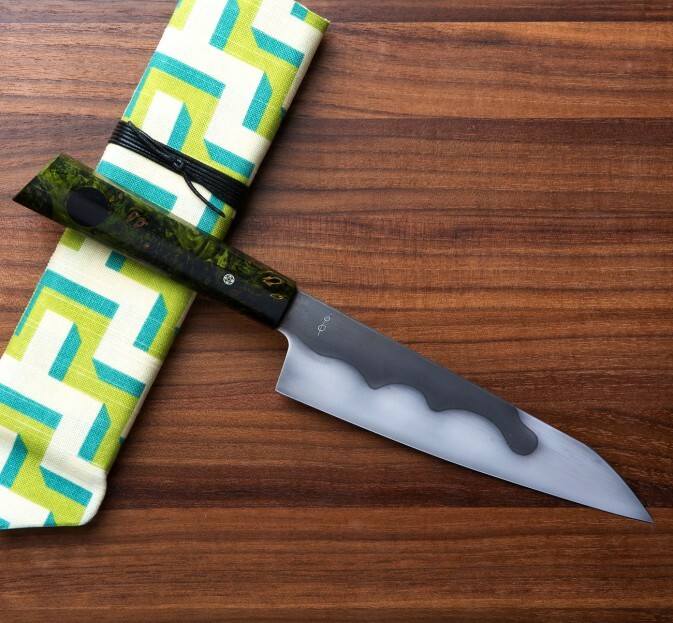 His eye for design and his recognizable aesthetic are the first aspects of his knives you notice, but they never take precedence over impeccable geometry and function. Blade length: 7.5" (190mm).  Overall length: 13". Blade width at heel: 2.75mm. Blade height at heel: 49mm. Weight: 5.6oz / 160g. Differentially heat treated 1095 carbon steel blade. Dyed and stabilized buckey burl handle with ebony inlay and mosaic pin. 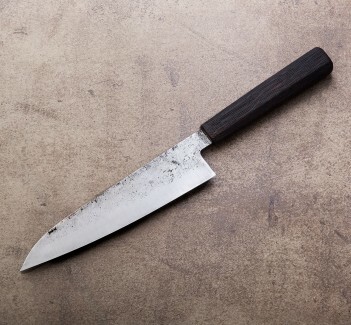 This is my second knife from Don Andrade. Worth every penny, not too heavy, well balanced, feels great in my hand and is exceptionally sharp. Design is awesome......love these knives!! !